It's not easy to be a trailblazer. Being first in any endeavor entails the risk of veering off the relative safety of the proven path. The family behind the Cambodian fast-food restaurant Chez Sovan Express here at Restaurant Row could have taken an easy route and offered up more familiar Vietnamese or Thai fare, but they chose instead to serve up cuisine true to their heritage. Being first means they've had to put as much effort into education of patrons as they do into cooking, and they don't get paid extra for the former. In bringing something new to this conservative town, they've made it a little easier for future generations of Cambodian restaurateurs. Still, in the iffy world of restaurants, it can be better to hedge your bets than go all-in. That's what Paradise Grill is doing by embracing the greater Southeast Asian region, bringing to the table dishes primarily from Cambodia, with a hint of next-door neighbors Laos, Thailand and Vietnam. The new restaurant occupies a space in Puck's Alley, at the far King Street end that has recently housed an ever-changing parade of bar/lounge/restaurants. Unlike Spices, the slick, contemporary Southeast Asian restaurant farther up the street, Paradise Grill registers as a humble mom-and-pop operation. It's clearly a newbie effort because you have to ask for utensils, service is pleasant but slow, and no pro would utilize only a third of the floor space available. The effect is of walking into a vast empty cavern, and a lot of people fear empty restaurants -- it all goes back to that "being-first-to-try" mentality. Those who do try -- usually the young and adventurous from the university -- wind up happy and leave vowing to return. Paradise Grill manager Ken Rath, left, and owner Anthony Deth hold dishes of steamed jasmine rice, left, Somlor Maju (sweet-sour Cambodian soup with shrimp), Cambodian chicken curry and flounder with ginger sauce. 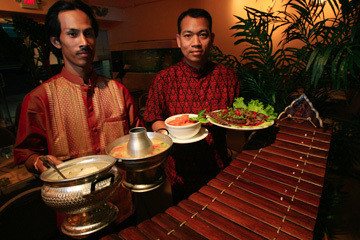 A traditional Cambodian xylophone, called a "roniet," is part of the dining room decor. A GLANCE at the menu reveals such familiar dishes as pad Thai, Thai curries ($6.95 or family sized for $14.95), spring rolls ($6.35), green papaya salad ($6.95), skewered meat satays ($5.95) and the Laotian beef salad larb ($6.95). Instead of settling in with the usual tom yum, available at any Thai restaurant, you might want to start with the similar Cambodian sweet-sour soup Somlar Maju. It's $5.95 with chicken or $6.95 with seafood for a small portion that would feed two, with other dishes. Go family size and it's $12.95 and $15.95, respectively, for four. Like so many Asian cuisines, Cambodian dishes aim to strike a balance between sweet, sour, salty and bitter flavors. Save for bitter, the gang's all here in a soup of fibrous lotus rootlets that look like skinny penne, and chunks of pineapple, squash and tomato. Seafood abounds here. Trey Jien Juen is deep-fried fish (tilapia, flounder or sea bass), at $8.95 to $10.95 for two or $13.95 to $15.95 for four, in a thin, sweet, red bean and soy sauce accented with slivers of ginger. A sweet-sour green mango sauce could also be available in season. Check with the kitchen on this one because it's worth trying if they have it. They'll also prepare a platter of deep-fried mussels, shrimp and calamari, but with little to dress up these morsels, it's almost a waste of seafood. You know how I feel about overcooking. If you're limited to one fish entree, make it the "amok." It's been called the Cambodian equivalent of Hawaiian laulau, but I think it has more in common with seafood dynamite, with coconut milk subbed for mayonnaise. In amok, kroeung, a spice paste of dried red chilies, galangal and garlic, is mixed with coconut milk and other ingredients, then poured over layers of collard greens and a mild whitefish, placed into a banana leaf "cup" and baked, then topped with thin slivers of kaffir lime leaves. The result is a sweet and rich, spiced fish that's a lot more exotic than any dynamite. Timid diners who can't appreciate the chilies or basil that flavor many Thai curries might want to try the red Cambodian coconut curry, which is smooth and mild and is no more exotic than a local stew, containing no strange pungent herbs -- only potatoes, carrots and your choice of shrimp or chicken. Speaking of strange herbs, stick to mint and basil served with the Cambodian crepes ($6.95 for two). A third bitter, weedy green was quickly discarded. The crepes are essentially omelets filled primarily with ground chicken and bean sprouts, meant to be eaten with your hands or spring-roll style in lettuce wraps. This was nice and refreshing but is best only if you've got a craving for eggs. For dinner, skip the tapioca that you can get anywhere and try the sticky rice with mango and a sweet coconut sauce. At this point you'll probably vow to return to further your exploration of this new world.